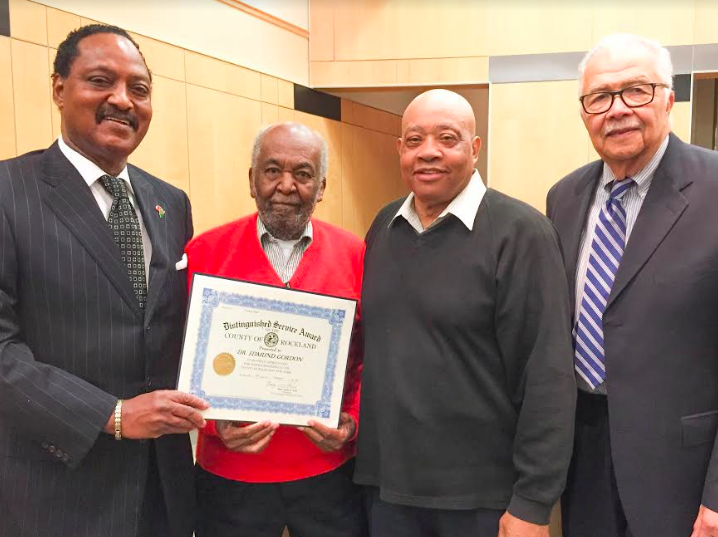 Rockland County Legislature Chairman Toney L. Earl led a celebration of Black History Month at Tuesday’s meeting of the Legislature, recognizing the contributions of three local residents – Willie Worsley, Travis Jackson and Edmund Gordon. “Marcus Garvey once said, ‘A people without knowledge of their history, origin and culture is like a tree without roots.’ The stories and contributions of Willie Worsley, Travis Jackson and Edmund Gordon keep us rooted and they make us proud,” Chairman Earl said. Throughout the year, the Legislature conducts special ceremonies to formally recognize the local residents who have helped to shape our county and, as is the case with these honorees, our nation. Each of the honorees is presented with a Distinguished Service Award, the Legislature’s highest citation. WILLIE WORSLEY was a member of the Texas Western Miners basketball team during its historic 1966 NCAA championship game against Kentucky. The school is now called the University of Texas at El Paso. Worsley, a guard who wore No. 24, and his teammates were the first all-black starting line-up in NCAA history. Their 23-1 record and tournament championship changed the face of collegiate athletics and paved the way for future minority athletes in the NCAA. The team was inducted into the Naismith Memorial Basketball Hall of Fame in 2007 and inspired the book and 2006 film Glory Road. Worsley’s own basketball career began at Dewitt Clinton High school in the Bronx and 2016, he was inducted into the New York City Basketball Hall of Fame. Worsley has worked to improve the lives of youth since the 1960s. He has served as the Varsity Boys’ Basketball Coach for Spring Valley High School for almost 20 years. DR. TRAVIS JACKSON was just 9-years-old in the 1940s and attending the Brook School when he noticed that the nearby Hillburn School for white students had a library, a playground and indoor plumbing – things his school did not have. The Brook School parents reached out to a young NAACP attorney who would one day rise to become Chief Justice of the Supreme Court, Thurgood Marshall. He took and won their desegregation case. In September 1943, the New York State Commissioner of Education closed the Brook School and ordered that all 49 children be admitted into the Hillburn school. Dr. Jackson was one of those 49 students. Notably, the Hillburn case served as the precursor for the Brown vs. Board of Education case that ended the segregation of schools in this country. The 2017 film “Two Schools in Hillburn” tells the story of the Hillburn desegregation effort. administrator for more than 30 years in Suffern and in northern New Jersey. He is also a civil rights activist and local historian. Early childhood education in America underwent significant changes after Dr. Gordon was commissioned in 1965 by President Lyndon B. Johnson to design the Head Start Program. Even today, the program provides comprehensive early childhood education, health, nutrition, and parent involvement services to low-income children and their families. Dr. Gordon focuses his scholarly expertise on educational reform and the impact of the “achievement gap” – the differences in academic performance of students based on race. In 2000, Dr. Gordon and his wife, the late Dr. Susan Gordon, founded the CEJJES Institute, a museum and community center created to document the African-American experience. The center continues to offer innovative programs of significance to the community. In 2005, Columbia University named its Harlem location the Edmund W. Gordon Campus of Teachers College at Columbia University. Correction – An earlier version of the article said County Executive Ed Day was on hand for the ceremony. In fact, Day’s appearance came at the Legislature later in the day.